The whole scene fascinated me and I wondered what the moral of the story could possibly be. There are many possibilities, however, the moral that stands out the most for me is: Only throw out what you wouldn’t mind having thrown back at you. Think about it for a moment. What if everything you tossed out in life was tossed right back at you? I’m not talking about trash per se; I’m talking about actions and words. If every word you spoke and every action you took was flung back at you, would you be more careful about what you said and did? 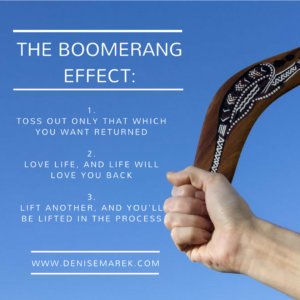 Consider: The things you do and say have a boomerang effect. Think back to a time when you made a negative comment or said something unkind. Did you feel light and happy in return? Probably not. You likely felt more frustrated, upset, and angry. On the other hand, when you did something kind for another or said something positive to someone, did you feel good? You probably did. When you lift someone else up, you can’t help but lift yourself up in the process. That which you give out is returned to you. Why is that? Acts of kindness cause your brain to increase the production of serotonin. Serotonin is a neurotransmitter that can help to reduce depression and make you feel peaceful, content, and even euphoric. When you dish out positives you increase your levels of serotonin and, as a result, you feel positive in return. That brings us back to the moral of our story: Only throw out what you wouldn’t mind having thrown back at you. Throw out negatives and you’ll get negative feelings in return. Throw out positives and you’ll get positive feelings in return. At any moment you can choose to change how you feel simply by tossing out what you want to receive. Lift someone else up and you’ll be lifted in the process. Love life, and life will love you back. 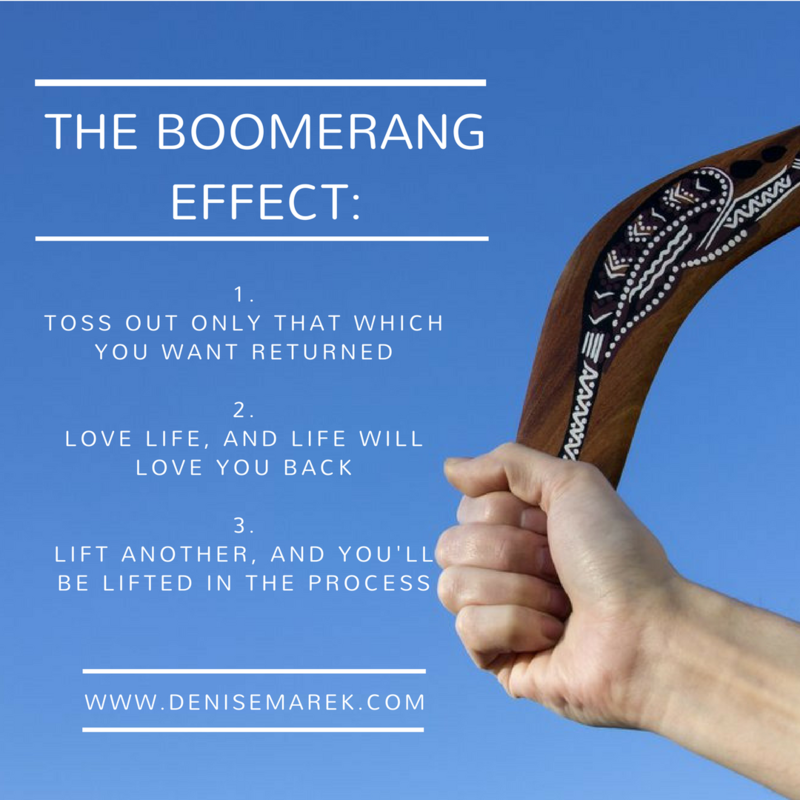 It’s just like throwing a boomerang—that which you throw away comes back to you.